Popular television show Lingo is now on your iPhone and iPad. Perfect word game. Guess the five-letter word. Moreover, Lingo does not require any special permissions. Lingo is the new word game of Msb Apps. You have 5 attempts to guess 5-letter word that you know first letter. Each guess must be completed in 1 minute. Green: Correct letter is in right position. Yellow: The letter is correct but in the wrong place. Red: When all the letters are red, it means that a word is not in the dictionary. In your first guess, you will earn 100 points. In your second guess, you will earn 80 points. In your third guess, you will earn 60 points. In your fourth guess, you will earn 40 points. In your fifth guess, you will earn 20 points. When you are stuck, you can use hint. You have 1 hint for each word. You can use it at any time by pressing the hint button in the upper left corner. You reach a very high score with the Lingo - Word Game and you don't know the next word. Will your score be wasted? Of course not, you can continue playing where you left the game by watching an ad. Be careful when you pause the game, time keeps flowing. Your scores are being held with the Game Center Leaderboards. You can compete for leadership with your friends and everyone else. Thanks to Game Center Achievements, your achievements are rewarded. You can achieve increasingly challenging successes one by one. You can play Lingo in English, Dutch, Spanish and Turkish. You can change the language of the game at any time by pressing the language button from the settings menu. Do not forget to look at how to play section by pressing on the question mark from the settings menu. 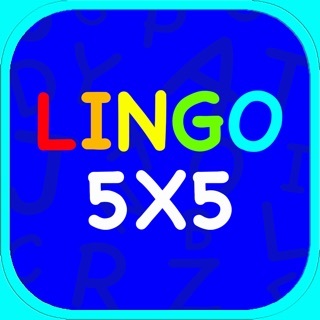 Lingo - Word Game was developed by Most Significant Bit Apps. * Performance updates have been made. I have always loved this game and often convince my family to play on trips. Great way to keep your mind strong. We are so happy to hear that, enjoy !!! Game could be fun but constant ads are annoying. And music kept coming on even though i had the sound silenced. That is the whole purpose of turning it off. I deleted the app. Thank you for your feedback. Adding option to remove ads is one of the things we are working on. Thank you for supporting our efforts and app with your valuable comments.